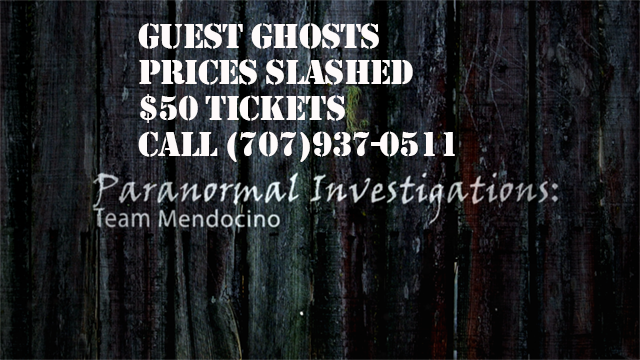 Mendocino TV and Paranormal Investigations: Team Mendocino present “Guest Ghosts, A Haunting of the Mendocino Hotel ” Participate in the Investigation for $150 $50. Overnight, Friday April 19th to 20th. Space Limited to 32 investigators. Call 707-937-0511 or look us up at mendocinotv.com. Teams of Investigators will be allowed to conduct their own 1 hr. investigations at four locations in the Mendocino Hotel. These areas are where paranormal activity has been reported multiple times. 6am Recap and breakdown of the night in the conference room in the morning. Sharing of memory sticks and distributing the media will be a subject of the morning wrap-up. Stay in your own private room in the Hotel throughout the night, use as your base of operations or just to get away for a break and a nap. Limited Availability. Ask the operator when you call The Mendocino Hotel at (707)964 0511. ask for the Guest Ghosts special. MEALS: Call (707)937-0511 for reservations. A special menu will be available for the event. Dine in the same room where the Ghost has been seen at two different tables. Make your reservation early! The Mendocino Hotel will serve several specials for the night. A Hotel Room Haunting , Room 16 and 7? A woman wearing turn of the century clothes, Cameo type hair, enters and leaves through the walls. Book an hour in one of the rooms with your own investigation gear, seance, sensitives or clairvoyant. two rooms have stories of haunts, book an hour for your team! Upper Hallway, sounds of a little girl and dog. Things go missing then returned. Put your own detection gear in the hallway. Battery and media check every hour, on the hour. “Guest Ghosts, Haunting of the Mendocino Hotel Garden Room” , A voice calling your name and laughing. Spend some time here and gather with other investigators. Audio and video recordings will be monitored all night long. Place your own gear! This is a scent free event. Some attendees are extremely sensitive to foreign scents. Please refrain from attending while using perfume, body wash, scented underarm deodorant, shoe spray, Hair spray, clothes dried with dryer sheets or perfumed detergent. Mendocino Hotel: Scariest Haunted Place To Stay In California?